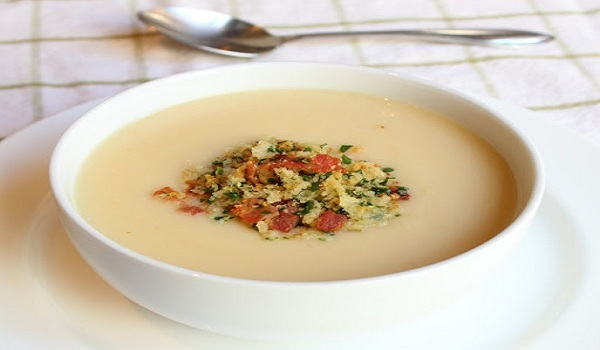 Cauliflower Cream is a very popular recipe. Learn how to make/prepare Cauliflower Cream by following this easy recipe. Lightly grease a baking pan and set aside. Steam cauliflower until cooked thoroughly. Split it into florets and cut the stem into small pieces. Transfer to the baking pan and sprinkle little salt. Combine eggs with warm milk in a bowl and beat gently. Stir in ¾ cup cheese and red chilies. Pour over the cauliflower and garnish with remaining cheese. Place the baking pan in a large pan filled with hot water, covering at least 2 inches upsides of the pan. Bake for 30 minutes, or until the crust gets golden.